1-3. Suzanne Collins’ The Hunger Games Trilogy, including The Hunger Games (384 pages, 2008), Catching Fire (391 pages, 2009), and Mockingjay (400 pages, 2009). Published by Scholastic Books. 4. 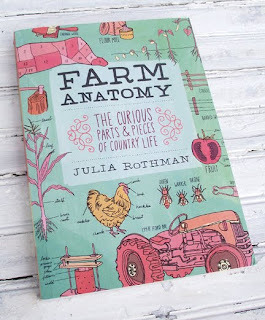 Julia Rothman’s Farm Anatomy: The Curious Parts & Pieces of Country Life (219 pages. Storey Publishing, 2011). This book is more of an illustrated guide to life on a farm, with detailed descriptions of parts of a cow, to tractor makes and models, all with beautifully hand drawn artwork. I liked this book so much I bought a copy for my folks to keep on their farm in Tennessee. It’s an excellent resource, especially for hands-on children. 5. Lysa TerKeurst’s Made to Crave: Satisfying Your Deepest Desire with God, Not Food (160 pages, published by Zondervan, 2010). This entry was posted in Random, Resources and tagged book review, farm anatomy, hunger games, julia rothman, lysa terkeurst, made to crave, reading list, suzanne collins. Bookmark the permalink.